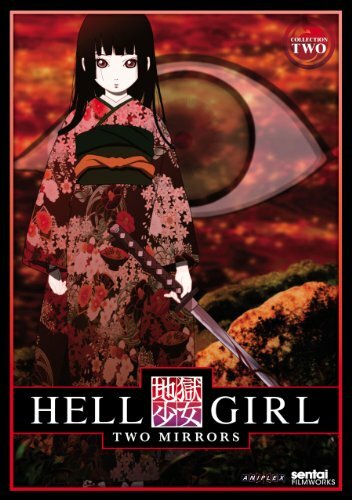 Collection 2 of Hell Girl: Two Mirrors (HGTM C2) continues the second season’s attempt to make Ai Enma’s sidekicks — Wanyuudo, Hone Onna, and Ren Ichimoku — into well-rounded characters, but succeeds in doing so much more. These 13 episodes, in fact, completely make up for the seemingly unfocused meandering of Collection 1. Specifically, these episodes regain some of the series’ iconic condemnation sequences, give the Hell Correspondents’ some convincing emotional back-stories and bait with which to justify the betrayal of their duties, as well as develop and leverage a strong story structure that parallels first season while making its own point. All of the Hell Correspondents, Ai Enma included, are getting tired of frivolous and unwarranted requests for vengeance, which they have had no choice but to carry out for the past 400 years now in hopes of achieving their own salvation. Instead of flippantly throwing out lines to the effect of “I can’t believe so-and-so is doing this,” the Hell Correspondents are directly involved in stories that touch each of them so deeply — due to likenesses to either themselves or their past lives — that each correspondent is moved to direct and active intervention. This introduces (mild) tension betwixt the group’s members. Everyone gets to point a finger, however, so fallibility pretty much evens out. Instead of being some randomly instituted loli ratings booster, Kikuri turns out to be a poignant addition to the Hell Correspondents. More or less the embodiment of the will of their master, Kikuri's antics grow from passive-aggressive playfulness into full-blown antagonism. While there seems to be no reason to her actions in the first collection, her actions in HGTM C2 serve to spur on the vengeful to supply Ai with more work and hell with more souls. This makes Kikuri the foil to Ai’s wavering commitment to consigning souls to hell. Speaking of which, damnation starts to get its Dante back in episode 15 but abandons it until regaining those progressive tracks of surrealistic comeuppances in episodes 19 and 21. When ironic tortures are not applied, the very ferry to hell is used to illustrate the nature of the damned. It is the return of these sequences as well as the return of stories that concern people who actually have serious problems that give more meat to these episodes than those of the first collection, but the morality and circumstantial twists lend to something greater. Just as the strength of season one lies in the threaded plot that develops from reporter Hajime Shibata’s investigation into Hell Girl’s consignments, HGTM C2 uses Detective Meshiai’s investigation into the rash of disappearances attributed to “devil’s child” Takuma (episodes 14 and 22–26) to define its purpose. These episodes, so well done that they bring to mind The Twilight Zone’s “The Monsters are Due on Maple Street,” make HGTM C2 about Ai Enma bucking the proverbial system by standing up for one person undeservingly sentenced to hell, just as she had been sentenced to death. This parallels the first season, where Ai breaks the rules to release her pent-up fury and avenge herself through the direct descendants of the same traitorous bloodline responsible for her unwilling sacrifice and accursed death. HGTM C2 succeeds in tying the previous collection’s seemingly flippant content into a story both poignant and well orchestrated. While its skill at enhancing supporting characters is questionable, the collection further rounds out Ai Enma and more importantly restores faith in the series’ signature bite while using it to accomplish something new. Instead of being pushed to the breaking point by hate as in the first season, the Hell Correspondents are broken by the conflict between mercy and their cursed duty. Taken by itself, HGTM C2 is a change of course for the series that seems to be tackled with all the subtlety of a sledgehammer. However, this collection shows its strength by knowing how to effectively leverage similar and contrasting content from pasts both distant and recent. This review is based on a Sentai Filmworks DVD set purchased by the reviewer.